You’ll also discover how humor and convenience help both marketing and customer care. I'd love to know if anyone i the BBR Network is using these techniques. Shep got his start in customer care when he was about 12 years old. He had a business doing magic shows for birthday parties. After doing a show for a 6-year-old’s party, Shep’s parents offered his first lesson in customer service. His mom told him to write a thank-you note, and his dad suggested he call the family to ask what tricks they liked and improve his show based on their feedback. When Shep was 16, he bought an old Jeep with a snow plow and started a plowing business. When his Jeep wouldn’t start at 4:00AM after a heavy snow, he couldn’t plow his customers’ driveways. He asked a friend with a newer truck and plow for help, and offered him all the money. That’s when Shep realized he was most interested in taking care of customers. After college, Shep continued to develop his interest in customer service, and today he’s focused on helping his clients achieve amazing customer experiences. He teaches people common-sense approaches that simplify customer service and improve company culture. He also travels around the world delivering speeches, and his team includes trainers who deliver his material, as well. Typically, marketers acquire the customer and then let someone else handle customer service. However, acquiring new customers costs more than keeping existing ones. As a marketer, you can benefit from these savings by giving existing customers a reason to share positive things about your company, product, or service. In doing so, you create disciples, advocates, and evangelists who praise your company. Whether your business is B2B or B2C, people talk about the people they do business with, good and bad. The best marketing you can have is existing customers who tell others about their great experiences. Using customer care to turn existing customers into brand advocates is different than using a promotion or incentive that gets people to share. When customer care becomes part of your marketing, you’re focused on making sure the customer is completely satisfied so they become return customers and want to tell everyone about your company. A byproduct of providing this level of customer service is that your company stands out as different from the rest. Being different is great because your company is then no longer competing head-to-head with the same product or service. That’s a powerful place to be in the marketing world. Social customer care is the actual service customers have with companies through social media channels. You no longer have to pick up the phone and call a company. You can tweet to the company, connect with them on Facebook, instant message them, connect through LinkedIn, and so on. The people who respond to these social media interactions are often the same people who would have picked up the phone. The interaction simply happens on a different channel. Increasingly, people are using their smartphones or mobile devices not for calls but for the apps companies create for connecting with customers. This trend has gotten stronger every year. Social customer care can be grouped into two subcategories: reactive versus proactive. With reactive customer care, someone might post a comment to a review site like TripAdvisor or Yelp, and the company responds. Usually, companies respond only to negative reviews or social media posts. With reactive customer care, timing is important. The moment somebody posts a comment about your business on social media, especially if it’s negative, you need to respond in a matter of minutes, not hours or days. Shep works with FedEx, which has an unofficial goal of responding to customers within 20 minutes. Once, Shep received exceptional customer service via Twitter within 10 minutes. During bad weather, his flight couldn’t land and was circling Dallas, where he had a connecting flight. When he saw that his connection was one of the few flights that wasn’t delayed, he used Twitter to contact American Airlines, and they responded that his spot was protected and thanked him for being a customer. When your company provides great social customer service, you build a relationship not only with a customer, but also with everyone else who sees that interaction online. Shep mentions that in the book Hug Your Haters, Jay Baer says social customer service can be a spectator sport. When someone posts a negative comment, people notice how long the company takes to respond. When you respond to a negative post, start by thanking the customer for letting you know and apologize for any trouble they’re having. Depending on the issue, you might need to move your communications to a direct message format to resolve the problem. If you have to move to a different channel, the telephone is ideal. After the issue is resolved, go back online and thank the customer openly. You might say, “I’m glad we connected and resolved your issue. Thanks for letting us take care of you and thanks for doing business with us.” In a perfect world, the customer responds by thanking the company for taking good care of them (although this doesn’t happen often). That’s a great testimonial for your business. You also need to react to positive reviews or comments. If somebody compliments your business, take a moment to say, “Thank you very much.” When people say nice things, their hope is that you notice and appreciate it. Responding is simply a nice thing to do. To help you find these posts and respond in a timely manner, you can set up a Google Alert or use social listening software that scours the internet for mentions of your company. The moment your name or your company’s name is mentioned (good or bad), you’ll get an alert. With proactive customer service, you enhance the customer’s experience by sharing great content related to your industry. A restaurant might post a favorite recipe. As a speaker and customer service expert, Shep is constantly posting content about customer service. Whether you share blog posts, tweets, quotes, memes, or something else, this content is part of the customer experience. Using social media to share important or timely messages is another way to offer proactive customer service. After developing a bad reputation for customer service, Comcast has tried to improve its reputation in part by alerting people when the cable goes out in a certain area. Comcast shares this message on multiple social media channels as well as email, text, and phone. YouTube is a great channel for how-to videos and answering frequently asked questions. YouTube videos offer phenomenal SEO and marketing because they show you offer answers online and demonstrate great uses of your product. One reason Shep uses Salesforce is that both the company and its customers created YouTube videos that explain how to do exactly what he wanted to do. Shep recommends turning your top 10-20 customer inquiries into a YouTube playlist on your channel. On his own YouTube channel, he addresses questions people ask all the time through Twitter, Facebook, and LinkedIn. Each week, he shares a blog post and a YouTube video that explain how to address some aspect of customer service. How-to videos are especially important for technical equipment or products that require assembly because they give customers a self-service option. When Shep bought a ping-pong table, all of the instructions were in German. After typing the manufacturer and model number into Google, he found a YouTube video that explained the whole setup process and saved him hours of work. Self-service is important because customers often prefer getting immediate help with a video and fixing the issue themselves. It’s a better experience than calling and waiting 15-30 minutes for telephone assistance. A self-service option can also save your business money because you invest once in the online video instead of helping customers with the same question over and over again. You don’t even need to invest much in creating your videos. You can use the camera on your smartphone. People will forgive mediocre video. Just make sure the audio quality is excellent. LinkedIn and Facebook groups are another way to offer proactive customer service. Groups provide a social, interactive experience that’s also marketing. Your advocates will be a part of the group, and they love to support and interact with other customers. Groups also help people share ideas. I note that having a group is super-smart because volunteers or moderators can answer people’s questions, but those questions can also become deeper conversations that reveal possible new features or ideas for your company. In social media marketing, Facebook seems to be a key platform for groups because people are showing up to engage there. For Social Media Marketing World, we’ll have more than 100 Facebook groups customers can join based on their niche such as university professors, religious organizations, or consultants. With these groups, people can interact and connect around our product, but I also think these groups will provide some amazing insights. Shep says the idea behind these groups highlights the way social customer service is an extended interaction with your customers. Social Media Marketing World isn’t just a two-and-a-half-day event. It’s months long, and the interaction happens both well before and long after the actual conference. Similarly, Shep provides support both before and after the speeches he gives for clients. Apps can also provide a proactive and positive customer service experience. Shep offers a free appthat features his latest blog posts and videos. If he’s offering a new product, he can create a page for it in the app. The app also allows him to share his speaking schedule. If the user allows it, the app can send a push notification when new content is available on the app. Although creating an app used to cost thousands of dollars, Shep says it’s now easy and inexpensive to develop one yourself. He uses a service called GoodBarber, which costs as little as $30 per month. As social marketing strategies go, this price makes an app accessible to solopreneurs. When you’re creating videos, tweeting, or offering other forms of social customer care, think about ways to make it fun or add levity. Humor done well can endear your brand to customers and it can go viral. In fact, the success of Dollar Shave Club got a tremendous boost when the company made a humorous video that went viral. Smart Car USA is another good example. Someone tweeted that a bird pooped on a Smart Car and totaled it. Smart Car USA responded with calculations about how many birds would need to poop on the car to damage it. The response included details about how much the poop would need to weigh to damage the car and how many pigeon, turkey, or emu poops you’d need to reach that weight. Humor can also work against a company when it’s used to offer criticism. After United Airlines broke Dave Carroll’s guitar, he tried to get them to pay for the damages. When they wouldn’t respond to him, he wrote a song called United Breaks Guitars and posted it to YouTube. More than 18 million people have watched this video. 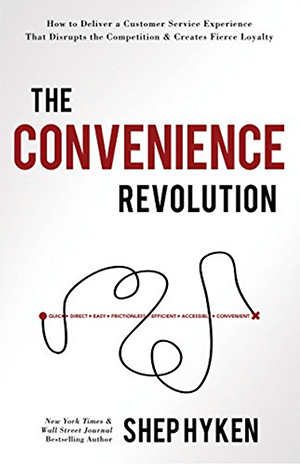 Shep wrote his latest book, The Convenience Revolution, after he realized he tended to continue working with companies when doing business with them was easy. Amazon one-click ordering and its Dash button are great examples of a total experience designed for convenience. Uber tried to eliminate all of the friction of calling for a cab if you live in the suburbs. With a licensed taxi, you needed to call and didn’t know exactly when the taxi would show up or how much the ride would cost. With Uber, you use the app to request a ride and to see how far away the driver is. The app also tells the driver where you’re going and tells you how much the ride costs. In the book, Shep identifies key ways to provide convenience. Reducing Friction: Like Amazon and Uber, any company can look at the points where they interact with customers and ask whether they can make those interactions easier. Although reducing friction is an element of all of the principles, some companies make it their total value proposition. Self-help solution: This allows customers to do their homework and take control of their needs. They don’t have to work with a salesperson. Panera Bread has kiosks off to the side so you can avoid the line. Before, you picked up your food at the counter. With their new system, a pager on the table tells a server where to bring the food to you. With the new kiosks and pagers, customers can have a faster experience and interact with employees at the table where they can build a relationship. This example reminds me of an airport convenience store with self-service registers. The only employee was a guy who stocked the shelves and handled questions. I thought that idea worked well in an airport where people want to get in and out quickly. Shep adds that Amazon Go has designed a store where you don’t have to check out. After you set up an account, you scan as you come in and then take what you need. The store uses sensors and cameras so that you don’t have to stop. You simply walk out with your items. Technology that creates a better experience: As discussed earlier, an app can create an easier, better experience. Subscription model: Every company needs to start thinking about how to create a subscription model. After someone becomes a customer, a subscription is ongoing, recurring revenue. As long as you do what you promised to do and deliver a good product and good service, customers will stay with you. Companies with subscription models include Netflix and Amazon. Many software companies offer subscriptions now, too. With Microsoft Office 365, you pay a monthly fee and always have the latest and greatest version of the software. Car manufacturers like Porsche, Volvo, Lincoln, and Cadillac also have a subscription that lets you switch models anytime you want. Delivery: Ask if you can bring your product to the customer. Shep left a dealership where he’d been a customer for more than 20 years because another dealership offered to bring him his new car, and pick up his car and leave him a loaner when it needed service. Now, he doesn’t visit the dealership unless it’s time to buy a new car. With Leo AR, you can create augmented reality movies on your iPhone or Android phone. With augmented reality, you can add things to the movie that aren’t there in the real world and record as if they are. After you find a virtual animated item you like in the app, you tap it and then tap where you want it to appear in your movie. Your camera remembers where the objects are as you record. You can even touch or move these items, which include animals, signs, or smiley faces. After you drop these objects into the video using the app, you can then use the app to record a video of yourself walking around and interacting with these animations. The app captures the sound in your video, too. The Leo AR app is free and available for iPhone and Android. Learn more about Shep at his website. Read Shep’s newest book, The Convenience Revolution. Follow Shep on Twitter, Facebook, and LinkedIn. Check out Shep’s course, The Customer Focus, and his podcast, The Amazing Business Radio Show. Read Hug Your Haters and check out Episode 156, where Jay talks about the book. Discover how to set up a Google Alert or use social listening software. See how Comcast shares timely alerts about its cable service on social media. Find out more about Salesforce and its how-to YouTube videos. Watch videos on Shep’s YouTube channel. Learn how to ensure your videos have high-quality audio. Download Shep’s app and learn more about the GoodBarber app development service. Check out examples of humor in social customer service with the Dollar Shave Club video that went viral and Smart Car USA’s bird poop tweet. Note how humor can work against a company by watching Dave Carroll’s song, United Breaks Guitars. Find out how Panera Bread kiosks and Amazon Go offer self-help solutions. Create augmented reality movies with the Leo AR app. Watch our weekly Social Media Marketing Talk Show on Fridays at 10AM Pacific on Crowdcast or tune in on Facebook Live.